A beautiful map of India in antiquity issued by J. Janvier c. 1750. This map covers the subcontinent from the Indus to the Ganges and as far south as Ceylon (Sri Lanka), which is here identified as Taprobana. 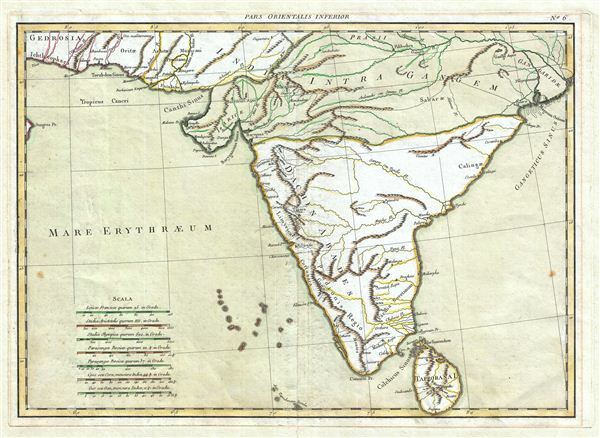 Shows various speculative mountain ranges running through central India as well as several early Indian empires citied in various questionable sources dating from antiquity. Very Good. Exhibits some edge soiling. Institut Cartogràfic de Catalunya, RM.268915.